'The true identity of humans is our soul (atma),' explains Devdutt Pattanaik. Chanakya in his Artha-shastra states that a king needs allies and an army to manage his enemies. Both the Ramayana and the Mahabharata elaborate on how kings need to create allies if they hope to fight and get back what belongs to them. In the Ramayana, when Ram and Lakshman learn that Sita has been abducted by the demon-king Ravana, they look for allies to help them find and rescue Sita. And this leads them to an encounter with the monkey kingdom where they make a number of allies. Ram's allies are animals -- vultures, bears, monkeys and squirrels. In his presence, animals are able to reverse the law of jungle and help humans. The vultures find out where Sita has been taken, the bears and squirrels help in building the bridge to Lanka, and the monkeys fight the rakshasas of Lanka and help liberate Sita. IMAGE: Arun Govil as Ram and Deepika Chikhalia as Sita from Ramanand Sagar's 1982 television series Ramayan. In the Mahabharata, the Pandavas are supported by the Panchalas, the father and the brothers of Draupadi. Their uncles, the Yadavas and the Madras, end up fighting for the Kaurava side; the Yadavas because Krishna tells the two sides to choose between him and his fully-equipped army, the Madras because their king mistakenly assumes that those feeding his army en route are Pandavas and promises to lead them to victory. Balarama refuses to fight for either side. Rukmi, Krishna's brother-in-law, is not accepted by either side. The sons of Arjuna and Bhima fight for the Pandavas. The division is mostly based on relationships and obligations, and not on dharma. Bhishma, Drona and Karna fight for the Kauravas not because they are upholding dharma, but because they value loyalty over everything else. Peace is always preferable to war. In both the Ramayana and the Mahabharata there are attempts to make peace, with emissaries being sent from both sides to negotiate and avoid war. 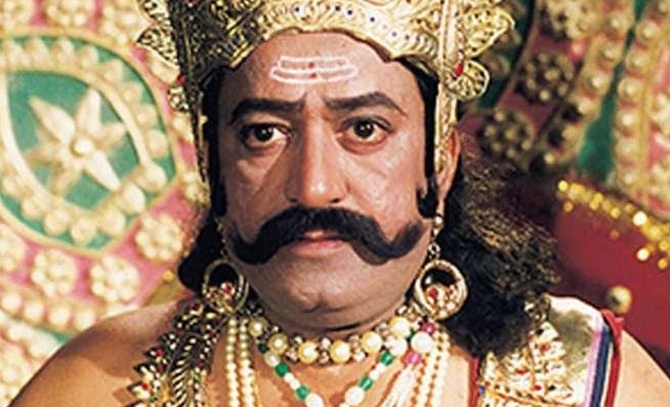 IMAGE: Arvind Trivedi as Ravan from from Ramanand Sagar's 1982 television series Ramayan. In the Ramayana, Vali's son, Angada, is sent to declare war or make peace with Ravana. Though young in age, Angada proves his strength before Ravana by challenging the rakshasas to move his feet which are planted firmly to the ground. They fail. Angada speaks of Ram's glory and advises Ravana to do the right thing and return Ram's wife. Ravana refuses, despite the entreaties of his entire family, including his father, mother and wife. Finally, war is declared. And the monkey army, armed with sticks and stones, attacks the fully-armed rakshasa army of Ravana. 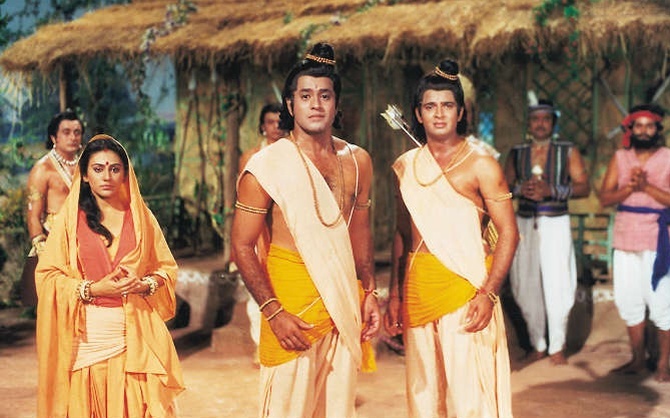 IMAGE: Yudhishthir, Bhim, Arjun, Nakul and Sahadev in B R Chopra's 1980 television series, Mahabharat. In the Mahabharata, two messengers are sent from the Pandava side and two from the Kaurava side to make peace and compromise. Satyaki tells the Pandavas to send an envoy only after ensuring they have strength on their side. While gathering allies, the Pandavas discover that the Kauravas have already managed to take many kings to their side. Drupada's envoy, who asks that the Pandava land be returned, is sent back humiliated. Sanjaya tells the Pandavas not to return. Uluka insults the Pandavas and tells them not to ask for what is not theirs. Krishna tries to broker peace, attempts a compromise, but fails. Even the offer to give the Pandavas just five villages is rejected by Duryodhana who does not want to part with even a needlepoint of land. Krishna then tries to divide the Kauravas by wooing Karna to the Pandava side. All these negotiations form an entire chapter -- the Udyoga Parva -- before the war. 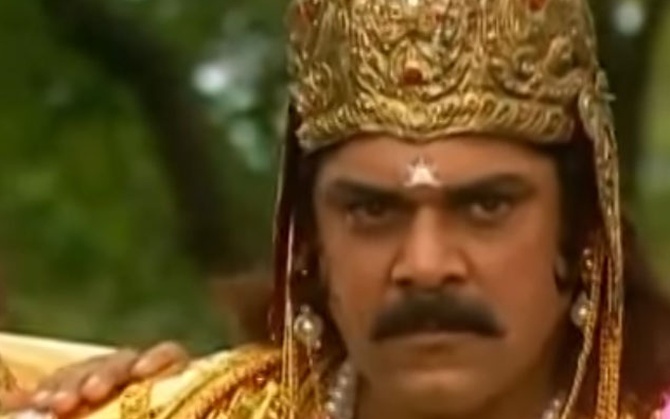 IMAGE: Pankaj Dheer as Karna in B R Chopra's 1980 television series, Mahabharat. Both epics differentiate between territory and property. Hindu philosophy cannot be understood without discussing matsya-nyaya, or fish justice -- the Vedic phrase for the law of the jungle. The first reference to matsya-nyaya can be found in the Shatapatha Brahamana, composed 3,000 years ago. Written a thousand years later, in both the Artha-shastra and Manu-smriti, we learn that kings were appointed by the gods to ensure that humans did not behave like animals, and claim 'territory' rather than respecting 'property'. In the jungle, might is right. The strong claim territory for food and to mate, and push away the weak -- as Vali does in Kishkindha and Ravana does in Lanka. Animals cannot bequeath titles and kingdoms to their children. Culture creates the concept of property. It becomes an extension of the self. In culture, your value is based on what you own. You are a function of your property. We often assume that Ayodhya is Ram's property and Hastinapur is Yudhishthira's property when, in fact, it is their responsibility. A king exists, as per Hindu philosophy, only to ensure that other people's property is safe. The desire for property, the attachment to property, the craving for other people's property -- all are indicators of insecurity, failure to recognise atma, and to be consumed by aham. 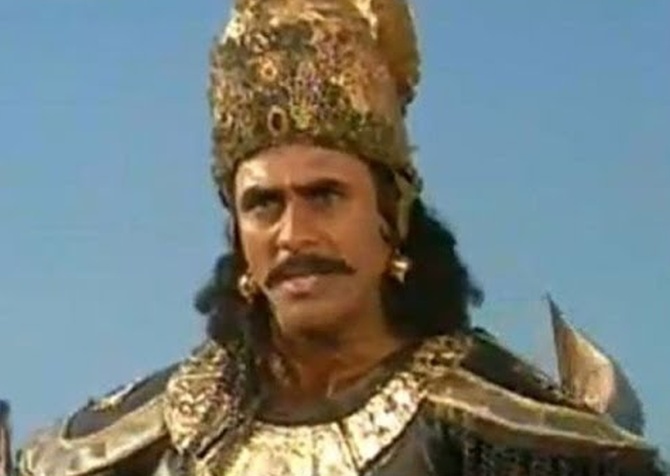 IMAGE: Puneet Issar as Duryodhan in B R Chopra's 1980 television series, Mahabharat. The fight over property is essentially a fight for what is 'mine'. For what is 'mine' defines what is 'me'. So, essentially, it is a fight for identity. As humans, we are struggling to know who we are. We establish our identity through property and civilisation evolves to protect this property. This identity, based on property, is ego (aham) -- a manifestation of insecurity. With wisdom and hindsight, we discover that true identity is not dependent on property. The true identity of humans is our soul (atma). While aham makes us cling and accumulate, and makes us envious, atma simply observes our fear and traces it to the mortality of the flesh that the atma inhabits. This atma is what the Rig Veda refers to as the bird that watches another bird eat fruit. In the Upanishads, this atma is described as something that is present within all organisms (jiva-atma) as well as all around us (brahman, paramatma). 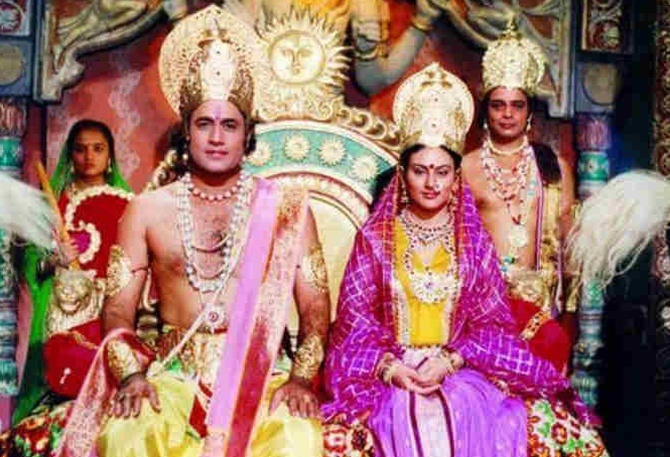 IMAGE: A scene from Ramanand Sagar's 1980 series Ramayan. Ram is the embodiment of this atma. So, he is at peace in Ayodhya as well as in the forest. He fights for Sita not because she is 'his', but because he is the defender of his family's reputation. He rules Ayodhya, not because he wants to be the king, but because that is his role as the eldest son of the royal family. As the king, he embodies dharma, overturning the law of the jungle, shunning the desire to dominate and be territorial, which is a manifestation of hunger and fear that plagues all living things (jiva). Only humans -- by virtue of imagination (manas) -- can overthrow this desire. Likewise, Krishna is the embodiment of atma who asks Arjuna to fight, not for property, not to seek supremacy over his cousins, not for fame or approval, not to indulge his aham, but for dharma, for social order, and to be a dependable brother who fights to get back the livelihood taken away by his cousins. This can only happen when he accepts the immortality, hence tranquillity, of the atma. 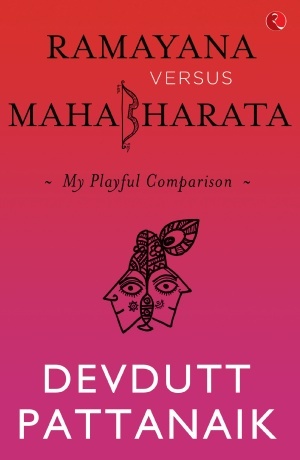 Excerpted from Ramayana Versus Mahabharata: My Playful Comparison by Devdutt Pattanaik, with the kind permission of the publishers, Rupa Publishers.